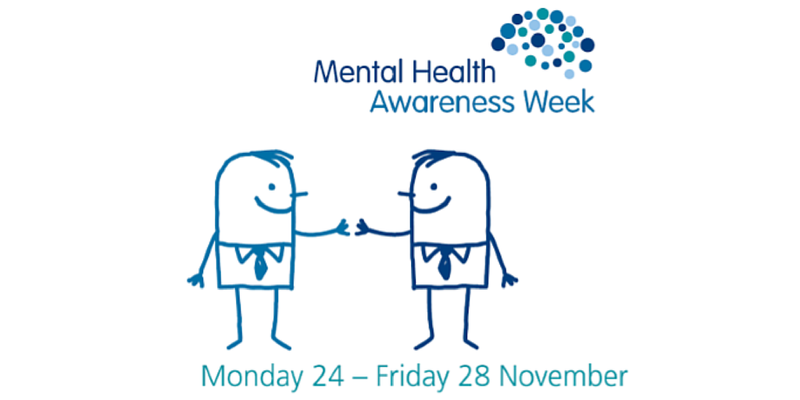 Last week was the University’s very first Mental Health Awareness Week, aiming to help eradicate the stigma associated with mental health and to raise awareness of the conditions which affect every 1 in 4 people in the UK. There were lots of events going on throughout the week for both Surrey students and staff, ranging from five-minute massages to workshops, art therapy Sessions and ‘free hugs’. 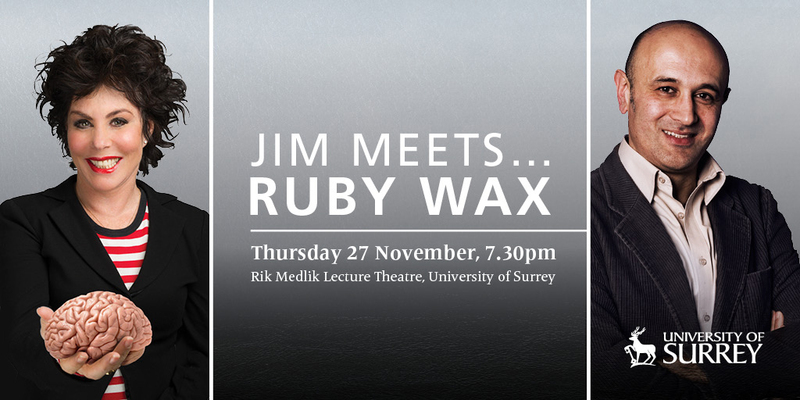 The main event of the week however, was a very special ‘Jim Meets…’ which saw University of Surrey Physics Professor and Radio 4 Life Scientific presenter Jim Al-Khalili interview comedian and mental health campaigner, Ruby Wax. Amongst other channels, social media was used as a tool to promote the event to our followers – a mix of current students, alumni, local people and others generally interested in the University. We received a large number of clicks through to our events booking page from both Twitter and Facebook, emphasising how valuable it can be – something definitely not to be ignored! Your tweets won’t last forever. By this, we mean that posting it at 9am will not guarantee every single one of your followers will see it – people will log on at different times throughout the day and may only search through the last 50 or so tweets (for example). If yours isn’t in there, they won’t see it… but posting the same tweet once an hour is not the answer to this! Think carefully about who you’re trying to attract and when they might be checking their Twitter account – is it in the morning on their way to work, at lunchtime or in the evening after dinner? Try the times that you think are most appropriate. Make sure you mix up your tweets. Don’t post the same tweet on multiple occasions, try adding images, calls to action, questions, quotes and see which one works best for your audience. You’ll be able to see which posts received the most engagement by checking your analytics. One final point to make, don’t over-post about your event. Depending on how often you post on Twitter 2-3 times a week is the maximum… you don’t want your followers to think that’s all you have to talk about! Hashtags. You’ve probably heard a lot of talk about them, but why are they important when promoting an event? Hashtags are a way of grouping together collections of tweets about the same topics, so can be really useful when you’re running an event that you want people to talk about. Choose something short, memorable and as self-explanatory as possible – if you want your guests or attendees to use it, it needs to be simple. We mentioned images above – they really are something not to ignore on Twitter! When twitter users are bombarded with a huge volume of content, which tweets are most likely to stand out? Attaching an eye-catching image can make people more likely to interact with the post than if it has not been included. Furthermore, you only have 140 characters to work with – chances are this won’t be enough to do your event justice, so adding an image gives you scope to include more information. You don’t need to be a designer to put something simple together, simple to use tools like Canva can be a useful way to create an image. Canva allows you to create images which are the perfect dimensions for Twitter (1024px X 512px) which means when scrolling through their news feed the image will not be cut off or distorted. Unlike Twitter, Facebook actively try to encourage the people who run business / interest pages to produce high quality content. This means it even more important that you aren’t perceived to be ‘spamming’ your audience as Facebook simply won’t serve your post to your followers. Think creatively about how you promote your event – use images, videos and other engaging content types rather than just a text-based post. Again, check your Facebook page insights for which type of posts your audience like to see and interact with. Keep the text part of your post as short as possible and format it so that it is easily readable chunks. The last thing you’d want to see on your Facebook news feed is a huge paragraph of text – you’re just not likely to read it. Again, using tools such as Canva to catch the attention of your audience and include more event information is a great idea. Using social media doesn’t just stop when the event starts, it can be used to interact with your guests and share some of the interesting things happening. For our ‘Jim Meets…’ event, pictures were taken and uploaded to Instagram and Twitter of the ‘behind the scenes’ set-up, building up anticipation for the event. Depending on the event, live tweeting the key information, quotes and take-home points are all useful. During the ‘Jim Meets…’ interview, we were live tweeting key quotes and themes from the University events Twitter account. If someone wanted to attend the event and missed out, they can keep up to date with what’s going on and even get involved in the conversation. Throughout the event, using the official hashtag (in this case, #JimMeetsRuby) was very important, as it collates all of the information together and can provide a useful place to signpost people who missed the event themselves and want to find out what happened. If you’re struggling with how to use social media during an event, take a look at this great article. If you’re attending an event yourself, get involved on social media! Whether it’s a conference or a live event, they’ll usually have an official hashtag which you can get involved with. See what other people are talking about and join the conversation yourself. If you’re at a networking event, it’s a great way to connect with new people and share your opinion on what’s happening. Take a look at this handy guide for using social media at a conference. Once your event is over, it can be useful to pull all of the exciting this that happened together. As mentioned above, there are often people who would have liked to come and have missed out. We create a Storify for many of our events, including our Open Days, Graduation and Welcome Week. It’s a great way to pull together all the relevant social media conversations into one place and share it. After the ‘Jim Meets…’ interview, we collated tweets from the audience, our ‘behind the scenes’ pictures and live tweets to tell a story of the evening. You can take a look at our Storify, here. If you’ve attended an event, tweet using the event hashtag and say what you thought of the day – if it’s good feedback, you’ll most likely make someone’s day! Blogging – where should I begin?